When you picked up your copy of the February/March 2007 edition of Outpatient Care Technology you may have noticed something a little different. Honestly, your mind’s eye isn’t playing tricks on you. And neither are we. Following closely on the heels of OPCT’s redesigned and relaunched Web site, the staff here spent much of the last half of 2006 massaging and updating the visual appeal of the magazine and its three sister publications, Imaging Technology News, Diagnostic & Invasive Cardiology and Acuity Care Technology. While other magazines fiddle with funkiness or wallop you with way-cool retro or even minimalism, we opted instead to adorn OPCT with a cleaner and more classic look that befits the professionalism and respectability of our readers, as well as one that represents our mission and the multifaceted, multimarket industry segment that we explore and report. On the cover you’ll find more information you can use. Inside, you’ll find all of the columns, departments and features you’ve appreciated for years. But we’ve thrown in some new wrinkles, too. 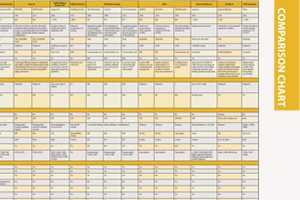 We’ve added more comparison charts to the mix this year – a reliable industry staple for which we are known and frequently copied by competitors. In fact, some of them are exclusive to our Web site, which you can easily access and search. We’ve also made the periodic “Outpatient Business Strategies” column a regular feature in the magazine, recruiting more business-minded authors to share their insights and intelligence with you. After all, as a professional in an imaging center, surgery center, cancer treatment center, women’s healthcare center or in some other healthcare facility, you’re in the business of caring for patients – and you can’t necessarily do that unless your doors are open for business. We’ve also launched a “carve-out” from our comparison charts, highlighting certain product categories that may be worthy of full chart status in the future, depending on reader interest and receptiveness. Think of our new Buyer’s Guides as a blend of product specifications in a “mini-chart” package, coupled with relevant product information akin to our marketplace. Be sure to help us with the next installment of the series, “Five Surgery Centers To Watch,” by sharing your thoughts and voting on OPCT Online at www.OPCTonline.net. Just click on the icon on the left-hand side of the front page. We appreciate your contributions and your loyal readership. Whatever you do, mean business. We welcome your comments on the topics found in Outpatient Care Technology.